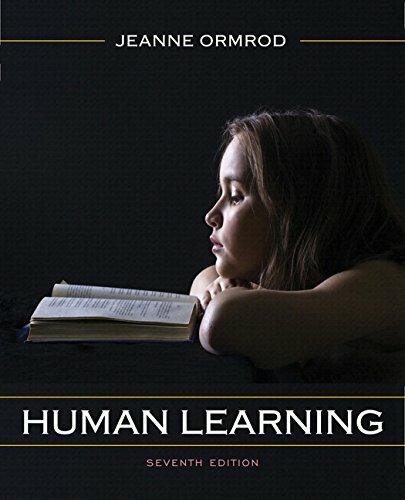 The market-leading education textbook on learning theories, Human Learning looks at a broad range of theoretical perspectives, including behaviorist, social cognitive, cognitive, constructivist, contextual, and developmental theories. It describes associationistic processes, such as classical and operant conditioning, as well as more complex and distinctly human processes such as metacognition, self-regulated learning, and critical thinking. Using a many concrete examples and specific classroom applications, plus a lucid, conversational writing style that truly speaks to students, the author engages students from the start, and makes the concepts, principles, and theories related to human learning and cognition meaningful. The new Seventh Edition features a condensed format, which ideally accommodates typical semester-long courses, coverage of a variety of new topics that have emerged in recent research, and significant updates to include such information as technological innovations in instruction and the neurological underpinnings of learning and behavior.